Hertford butchers. Buy fresh local produce. Our customers always come first. Our Hertford butchers team is always on hand to provide that personal touch and friendly advice to aid you in your purchases. 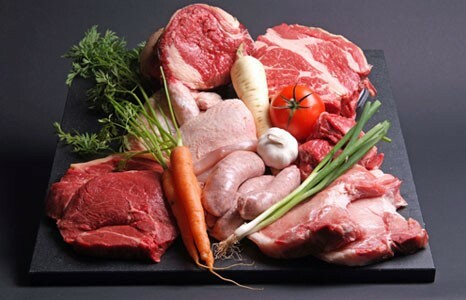 Butchering an entire carcass enables us to provide you with cuts of meat to meet your specifications and cut to the perfect size for your event (unlike most ‘butcheries’ which receive their meats part boned and processed and then vacuum sealed). One of the specialities within the butchery department at Foxholes Farm, is the provision of a purpose built ‘curing room’. 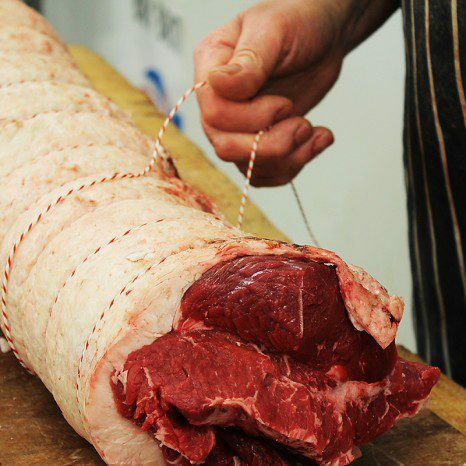 Our butchers cure our own pork and beef, using the ‘dry cure method’. This draws moisture away from our bacons, gammons, hams, pastramis, salt beef and ox tongue, rather than adding moisture by the ‘brine curing method’ which is more commonly used. The ‘dry cure method’, although more time consuming, gives a much firmer, solid product, with no hint of ‘wateriness’ – you’ll enjoy bacon that doesn’t fill your pan with juice. Our butchers produce all of our own sausages, chipolatas and sausage meat, using our own Saddleback pork, right here on site. Made the ‘old fashioned way’, hand linked, using trim from our own pork and beef (unlike many butchers who purchase ‘trim’ with no provenance) and, as you’d expect we use only natural casings. All of our flavours of sausages are made using natural, seasonal produce, such as fresh leeks and onions, Much Hadham honey and black pudding, and for our beef sausages, horseradish, chilli flakes and cracked black pepper. Our gluten free sausages, which can be bought fresh and are always available frozen, are also made using the same methods and attention to detail. Our butchers are always happy and prepared to offer you marinades to complement your meats and you will find hand-made, hand-shaped burgers, koftas, BBQ packs, chipolatas, plus many, many more inspirational ideas, recipe leaflets and advice to make the most of your purchases. To complement and extend our own pig production, we also provide all pork cuts from a free range, local commercial pig producer. This provides us with a leaner carcass, reared under the same ethical standards as our own herds. Lamb is not reared on site, but supplied by a small local producer who, like ourselves, is a local farmers’ market attendee. Again, the lamb is free range, grass fed and ethically reared for fuller flavour with, of course, similar attention to welfare standards as our own. We supply local estate venison as well as pheasant, rabbit, partridge, duck (including Mallard) goose and turkey (subject to season). Foxholes Farm geese and turkeys are sourced from two small, local, free range poultry producers. These are fabulous birds, arriving to us hand-plucked, dressed and ready for you to pop straight into the oven. Small game birds and rabbit (occasionally hare too) are sourced from our own and neighbouring farms as well as the game shoot which runs through our arable farm between Ware and Wareside. As veal calves are male dairy calves, our veal is sourced from the famous ‘Blue Grass’ Jersey herd from our neighbours’ farm – right here at Hertford Heath. Tender, pale, free range, grass fed and delicious. A recent addition to the shop’s range includes a wide selection of frozen fish available all year round.